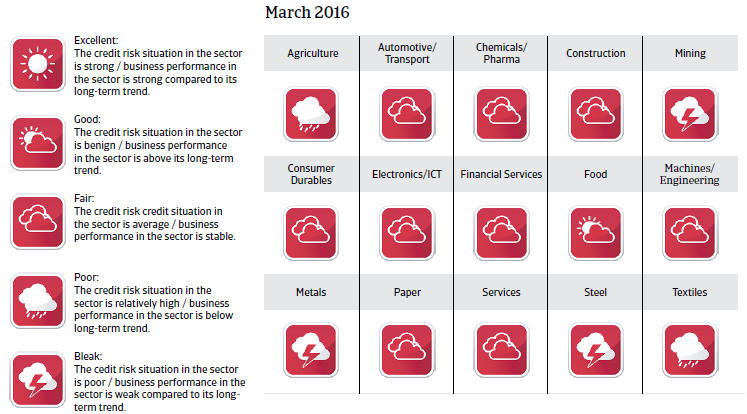 A hard landing of the Chinese economy and growing social unrest remain downside risks. The government headed by former army officer Ollanta Humala continues to face a series of challenges, including rising tensions with the opposition, in-fighting within the ruling Gana Perú coalition and on-going corruption scandals. Institutional weaknesses still hamper governability and necessary social reforms. Next presidential and parliamentary elections to be held in April 2016. Despite remarkable economic progress made in the last few years, the country still has to cope with high poverty and very large income inequality, especially between the coastal and the heartland regions. There are still social conflicts flaring up, mainly in the vital mining sector. The lack of effective state control in some remote areas remains a challenge for the government, enabling illegal business activities (contraband trade, coca-leaf farming), and some radical groups to cause social unrest and to disrupt business. Peru’s small, open economy is highly dependent on minerals (copper, gold, oil and gas), which account for more than 60% of exports. Due to this dependence and a large informal economy (more than 50% of the workforce), high corruption and poor governance in the public sector, Peru’s economic structure is rather weak. After recording high annual GDP increases between 2010 and 2013 growth slowed down since 2014, mainly as a result of decreased commodity prices. 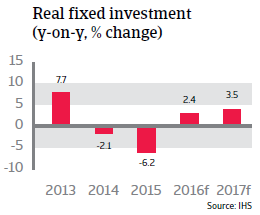 However, due to prudent economic and fiscal policies during the boom years with regular budget surpluses, the government has room to stimulate growth with higher spending on capital investments (e.g. two mega mining projects and public sector infrastructure projects) and social programmes. This is accompanied by robust consumer demand. 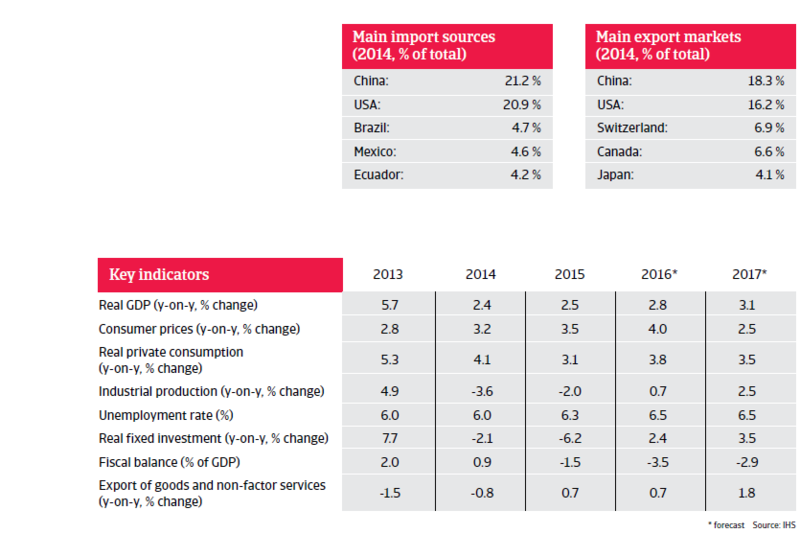 The Peruvian economy is expected to increase 2.8% in 2016 and 3.1 % in 2017. 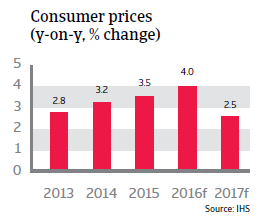 In 2014 and 2015 inflation increased above the Central Bank’s target rate of 1%-3%, and is expected to increase further in 2016, despite a tighter monetary policy. Peru’s liquidity situation is very strong, with international reserves amounting to about 16 months of import cover. Solvency is under control, despite increased external borrowing by the private sector, as debt service is manageable at 15%. The current account deficits are moderate and to a large extent, but no longer fully, covered by foreign direct investments in the mineral/mining sector. The solid liquidity and solvency ratio bolster Peru’s resilience against external economic shocks. 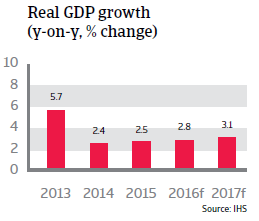 Main risks to Peru’s economic outlook are a hard landing of the Chinese economy and growing social unrest in the mining sector, which would negatively affect the investment climate. At the same time, Peru’s small, but well-capitalised and supervised financial sector is highly dollarized (i.e. the US dollar is preferred in large transactions and in savings), leaving it exposed to potential currency risks. To sustain high growth rates going forward, the government needs to step up structural reforms, such as reducing state bureaucracy, strengthening the judicial system, reducing the rigidity of the labour market, and improving infrastructure/education.